Behold, the coin-operated amusement device which received a patent in 1897 for inventor John Milo, an Italian-born priest in the Bronx who invented things like this as a hobby. 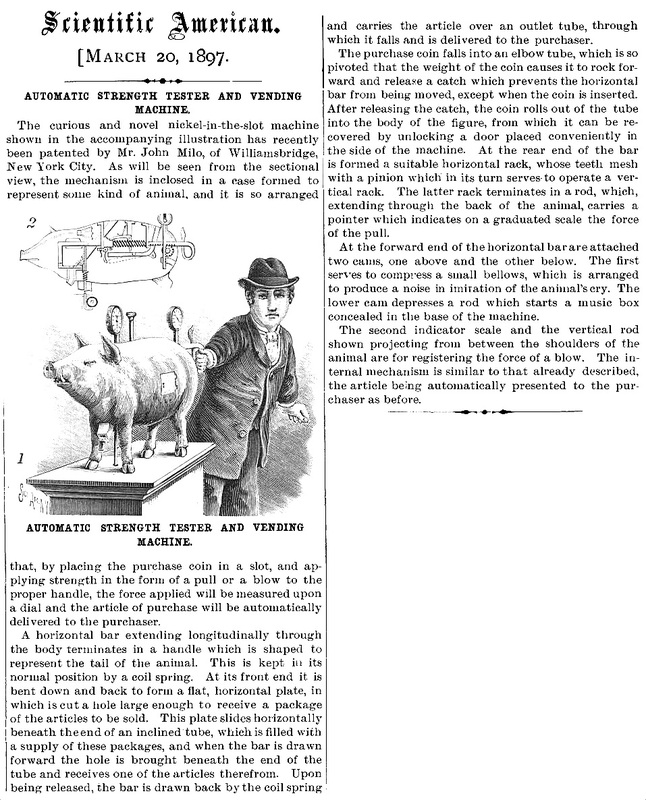 His pig — the model of which he said cost $3,000 to manufacture (about $9,000 in today’s money!) — would variously dispense chewing gum, measure one’s strength, play ragtime music, and/or squeal like a pig (when you twisted its tail). Talk about bang for the buck! Father John Milo (1853-1918) was a Catholic priest who founded St. Roch’s Church in the Bronx, a church which served a parish of mostly Italian immigrants. He was first and foremost a priest, but his inventing sideline was an important part of his life and a source of enjoyment and relaxation. He developed all sorts of things, from self-winding watches to pedometers to electric church chimes. Not only was his workshop-tinkering an enjoyable pastime, but he was really hoping to cash in on a big money-making patent one day. He had passed up a $20,000 offer from a chewing gum company for his pig creation (about $600,000 in today’s money) because friends urged him to hold out for a bigger bonanza. Soon after, though, machines like this “slot machine” were classified as gambling devices, and Father Milo’s big-bucks dreams of bringing home the bacon with his porky patent were dashed forever. 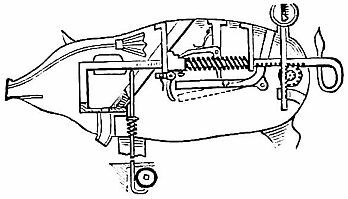 Read two newspaper interviews with the “inventor priest” which appeared in 1906 and 1907 (about ten years after his pig and goat machines), here. He seems a bit bitter about his lost opportunity to cash in on the pig (if priests held grudges, those friends probably would have been at the top of his personal list), and there was definitely more than just a world-weary resignation about a mechanical mouse patent which he sold for a relative pittance to “a Frenchman” who ended up making in excess of what would be 200 million dollars in today’s money (a sum which seems hard to believe, but, that’s what the priest said, and who wants to doubt a priest). Thank you, Father Milo, for your inventing work. 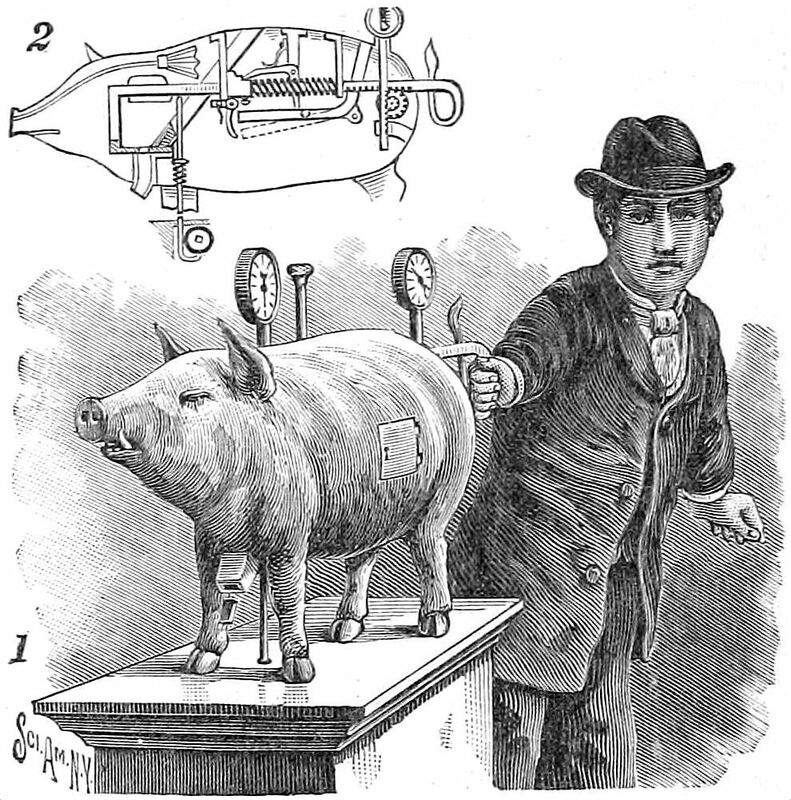 That illustration of a man pulling a mechanical pig’s tail has made my day. I have no idea how or where I stumbled across that great illustration of the guy in a hat pulling the pig’s tail, but I’m certainly glad that I did. Thank you, anonymous Scientific American illustrator! 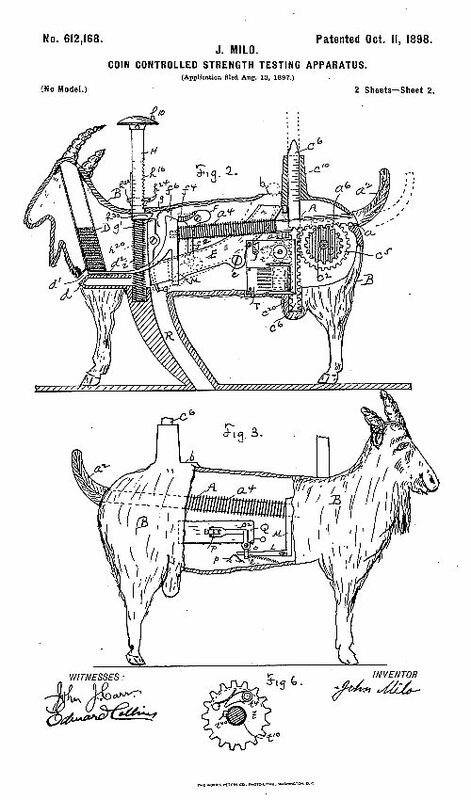 John Milo’s coin-operated pig and goat patents can be perused on the United States Patent and Trademark Office website here (pig, 1897), and here (goat, 1898), complete with drawings and full descriptions. Build your own! I can’t help but think of the Monty Python “flying sheep” sketch when I see these pig drawings (watch the sketch on YouTube here). All images are larger when clicked! 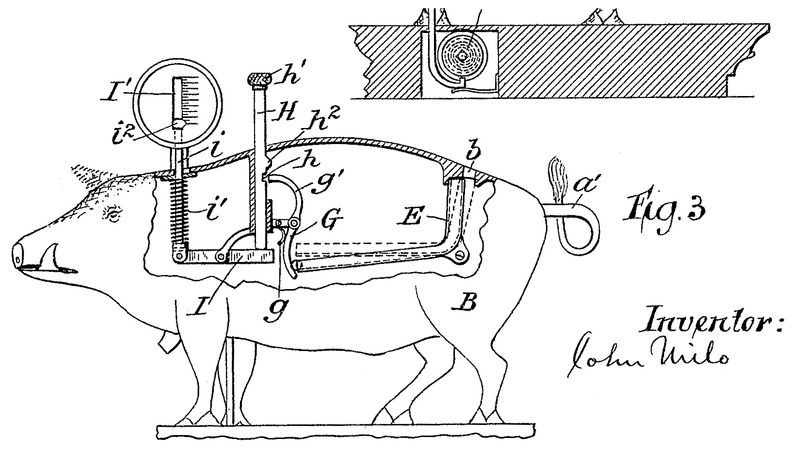 This entry was posted in 1890s, Animals, Science/Technology, USA: New York and tagged Inventions. Bookmark the permalink.